Having had a byrton 25 before which was great I have found this to be really very good it has features galore and does what it needs to very well my only gripe is that it wont pair with my old heart rate monitor Lezyne have excluded some monitors due to poor performance and to be fair my monitor had always been somewhat buggy since I owned it. Otherwise a good computer thats well made it's been out in absolutely torrential rain with no issues and works really well with awesome features for the price. Very disappointed in the super gps lezyne. After 3 months the screen went blank and died forever. Second problem was my lezyne heart rate strap chews through a 2032 battery every1 -2 rides. My old polar strap lasted 4 years. Lezyne easy to charge, compact and has lots of info including cadence. Next time I will follow the herd and buy Garmin. This is an ok GPS and is quite good value for money, but it does have a few quirks if you are used to using some of the competing products. First up, all the buttons are in different positions and take quite a bit of getting used to. This is even more of an issue if you are still using some of these other products and are switching between them. 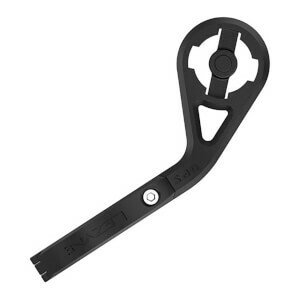 The lack of mounts is also an issue - it is hard enough getting extra standard mounts, but almost impossible buying out-front or other style mounts, unlike Garmin mounts where there are many different after-market options available. You definitely need to upgrade the firmware before using as the device is very flakey until you do this. When using with a speed sensor, it appears not to be able to do automatic calibration (unlike some of the competition) - you need to enter a very precise wheel circumference to get accurate distance measurements. The only way to do this well is to calibrate it using another GPS device at the same time, preferably one that will also talk to your speed sensor. Very good unit. Had some trouble deciphering the inistructions but put that down to being an UNtechnophobe. 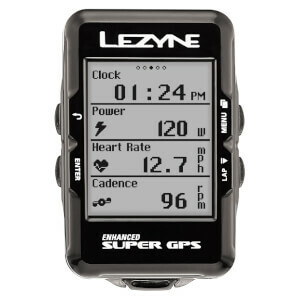 Love the Lezyne super gps,does everything i want ,speed ,ave.speed ,distance ,time and much more.Picks up gps within seconds even picks it up indoors and never loses contact .so far so good, only been using for a month but am not disappointed .I wear reading glasses and can easily see 4 lots of info on screen so glad i never spent my money on an overpriced Garmin,Easily syncs to your phone and immediate upload to strava through your bluetooth connected to your phone no need for wires and laptops,this has got to be the best buy of the year. This is a great unit for the price. It records rides and displays almost all of the data that I need. However, it doesn’t matter what I do, it keeps losing the Bluetooth connection to my iPhone. This means that notifications from the phone don’t show up. This is pretty frustrating. And yes, I’ve spent time with both the Lezyne and the PBK good folks trying to get it to work. So, if you want a GPS unit with all the major functionality at a great price then this is gold. If you need to know who’s calling you though give it a miss. Why spend more this is a sweet gps with all the features you can want. First off, this head unit will work alone to display/record basic GPS based data (e.g. speed, distance, elevation, grade) without any external sensors, and when paired with Bluetooth or ANT+ sensors (HR, Speed, cadence, power) displays/records that data too. In the case of speed and (I assume) distance sensor data overrides GPS data. That said, while the computer can be used alone the bundle with HR strap, speed/cadence sensor and "out front" mount (which I bought) is a good deal. The ability to set-up up to five pages of data (each with a definable (2-8) data fields) should be enough for even the most obsessive data junky. The display uses heavy fonts that should be easily readable by anyone with normal vision (in my case I have no problem with bifocal lenses). The mount is solid and there is little chance the unit will shake/pop loose by accident. That said, it's not a low profile device, since it sits quite high on the mount. The latest firmware (available form the Lezyne site) appears to be solid. Data is recorded in a format that can be imported into a number of sites beside Lezyne's own on line site (eg. Training peaks, Ride with PS, Strava ...) The one thing I miss is a barometric altimeter ... GPS data is OK, but not as accurate. Also, I haven't (yet) figured out how to define more than one bike (although this can apparently be done (up to five bikes according to the manual) through the available phone based app (not being a cell phone user I can't comment). I have used the computer for one 2 hr ride so I may have other comments later. I read a number of reviews before buying ... several fairly negative... but so far I'm impressed.